Hi! You guys know how I love my drop cloth decor. Especially pillows. They are so fun to have for different holidays. 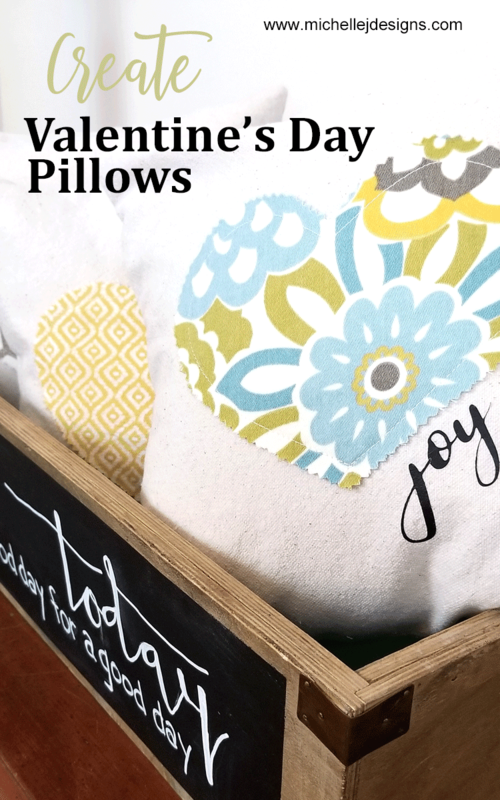 Today I am making some Valentine’s Day pillows but they aren’t the typical Valentine’s Day colors. 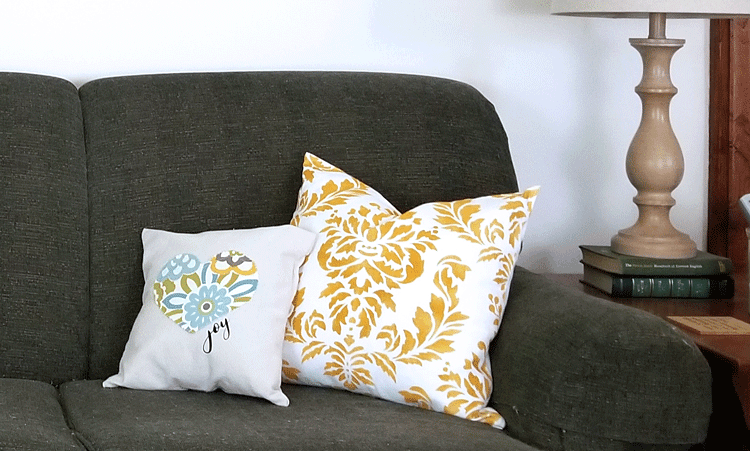 These pillows were made to blend and match my current home decor. I just love them and I can’t wait to show you what I did! Valentine’s Day to me always means hearts and xoxo and love. It also usually means pink, purple and red. I wanted to create some Valentine’s Day pillows but I didn’t want them to clash with my decor which is what these typical holiday colors would do. So I rummaged through my fabric and found some scraps that would work perfectly with drop cloth fabric. 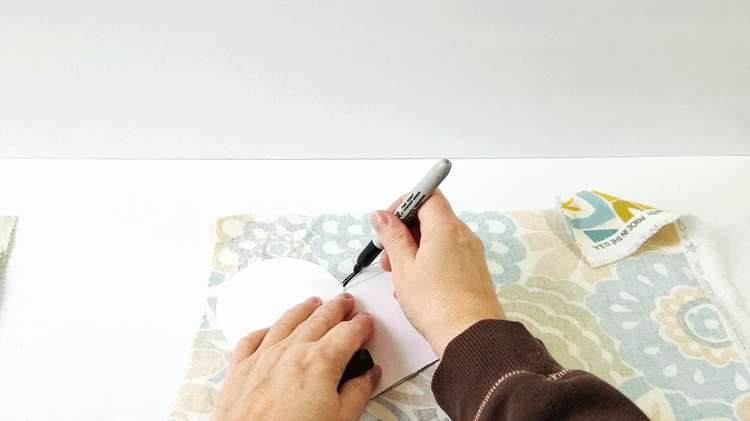 There is a printable materials list and instructions for you after the video. 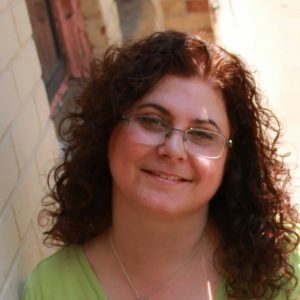 And if you like a written tutorial with photos scroll down a bit. I have included that as well. You can watch my step-by-step video below and be sure to subscribe to my channel! 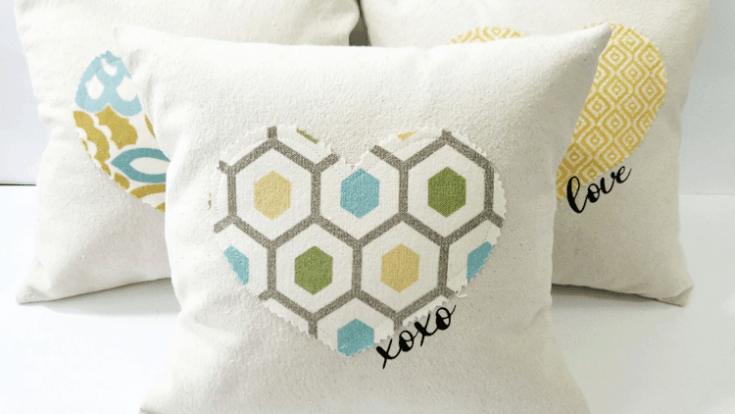 Use some fabric scraps, a drop cloth and heat transfer vinyl to create Valentine's Day pillows. 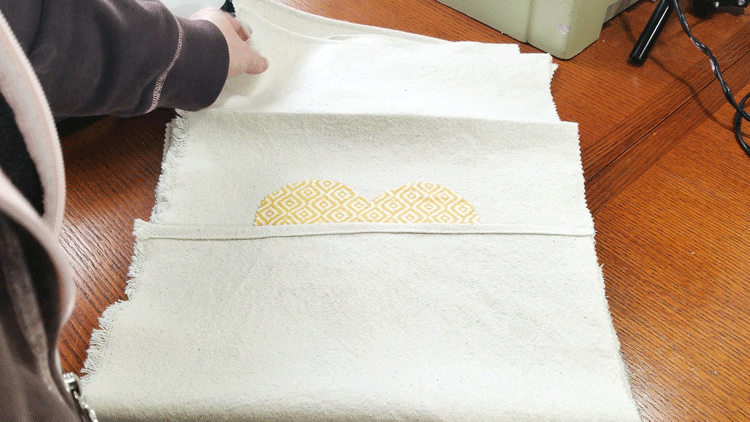 Finish the two ends of each fabric piece by folding over the unfinished edges 2x and stitching along the edge. 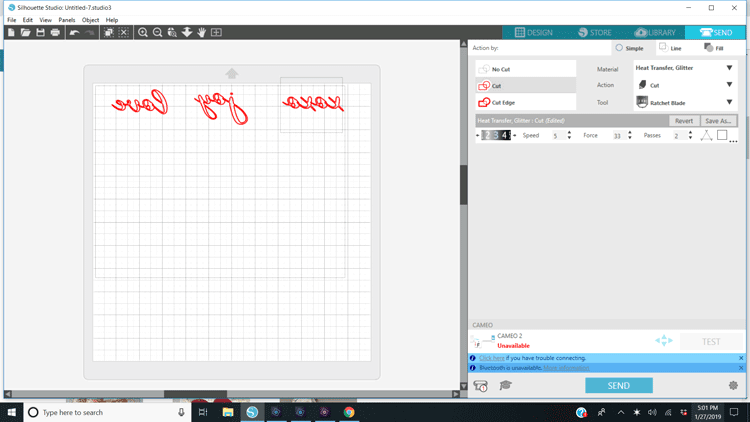 Use the font of your choice (I used Solar) and create your designs in the Silhouette design space. I used love, xoxo, and joy. Cut them out using black iron on vinyl. Be sure to mirror them before cutting. 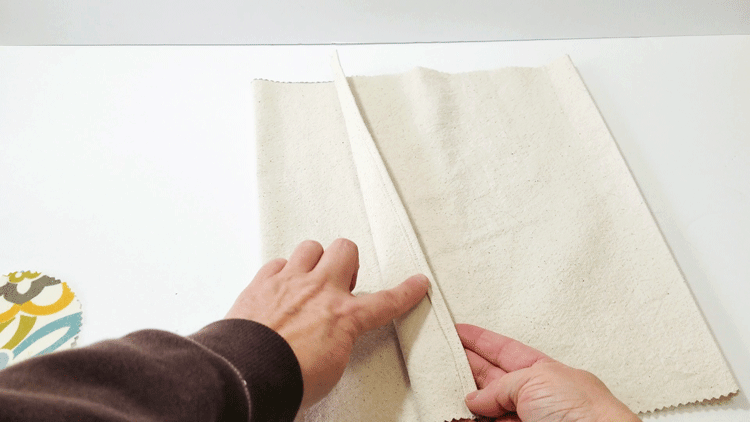 Fold the ends of the drop cloth fabric in with right sides together using the iron creases as a guide. 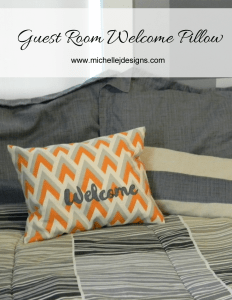 As I have mentioned many, many times before by fabric of choice, especially for pillows is drop cloth. I purchase my drop cloths at Menards and when they are on sale a 9ft x 12ft piece is only about $14. This is a huge piece of fabric and can be used for a lot of projects. One drop cloth will last me quite a while depending on what I am making. 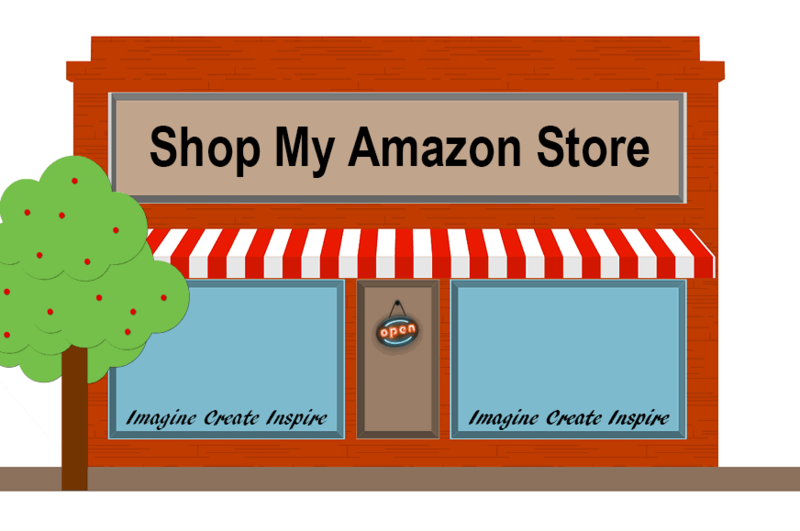 The link I am using is for Amazon but if you have a Lowes, Home Depot or Menards near you check there too. You will want to wash and dry your drop cloth a couple of times to make is soft and ready for crafting. 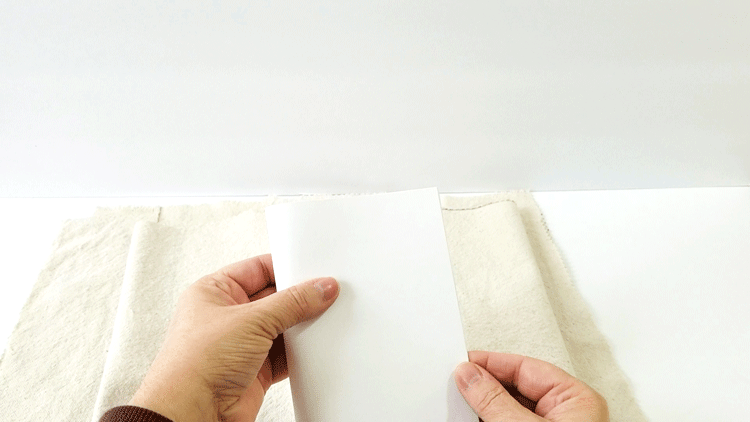 Cut three pieces of the drop cloth measuring 13″ x 26″. This will form the “envelope” for our pillow. 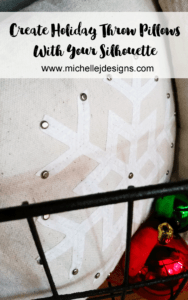 Envelope pillow covers allow you to remove the pillow form and wash the pillow if needed or to switch the pillows out for different holidays or seasons. 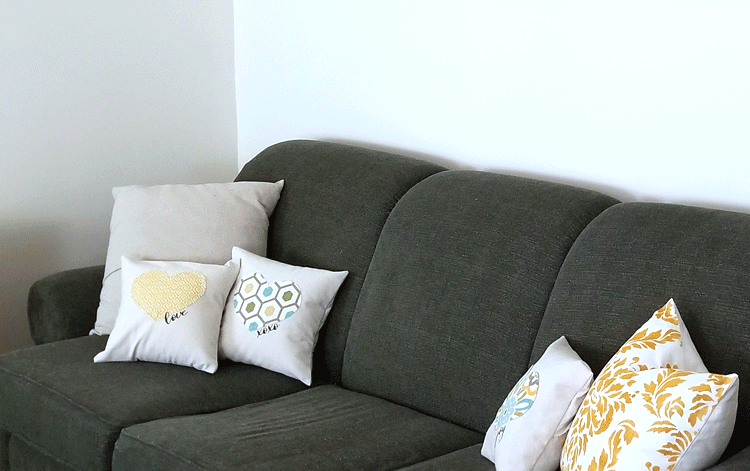 This is a very budget friendly way to change out your throw pillows. The two smaller ends need to be finished because they will show. Well, one of them will show but both need to be finished. Start by ironing the edge over about 1/4 inch. Then turn it one more time and iron again. 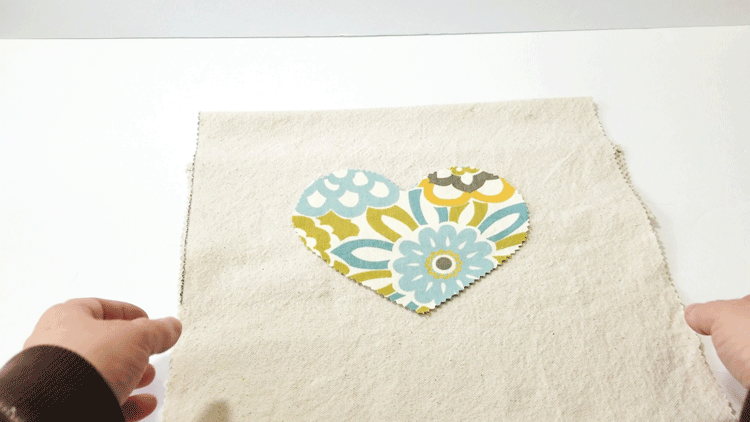 Stitch along the edge to create your finished end. 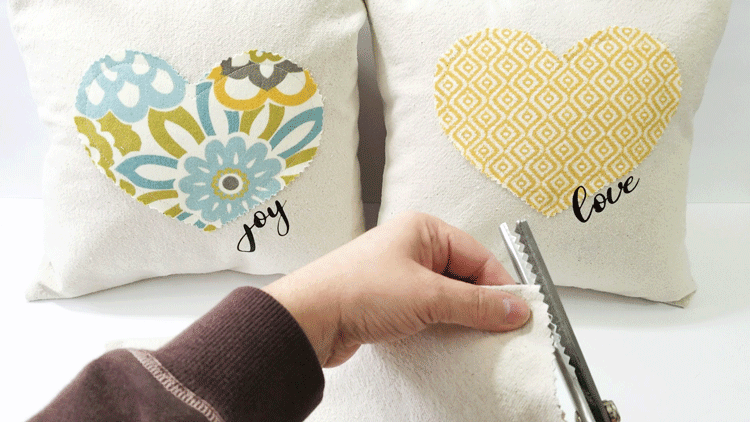 You want to find the front of the pillow so you can stitch the heart and place the words in the right spot. To do this fold over the edges and crease with the iron the top and the bottom of the piece. You will want it to be 12″ from top to bottom. This is the size of the pillow form. 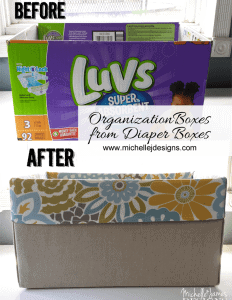 This is a great way to use up scrap fabric if you have some. 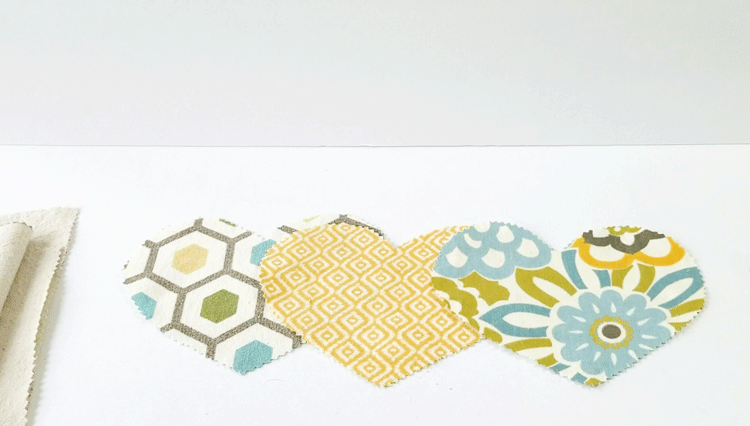 If not you can purchase fat quarters from the fabric stores or from WalMart. Otherwise you can just purchase smaller amounts of the fabric or your choice. 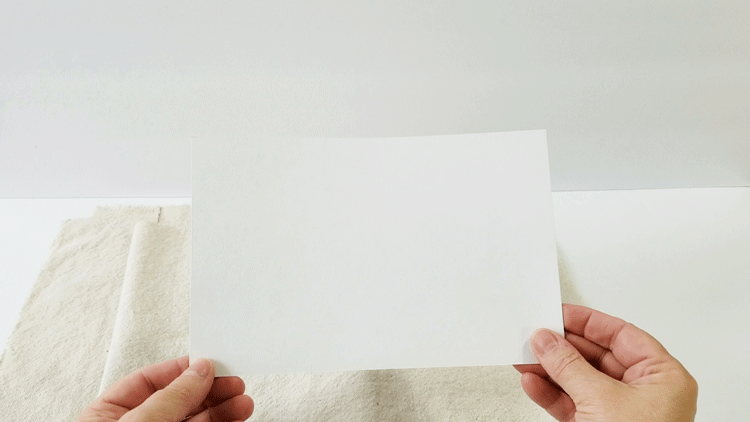 Start with a 5.5″ x 8.5″ piece of card stock or paper. 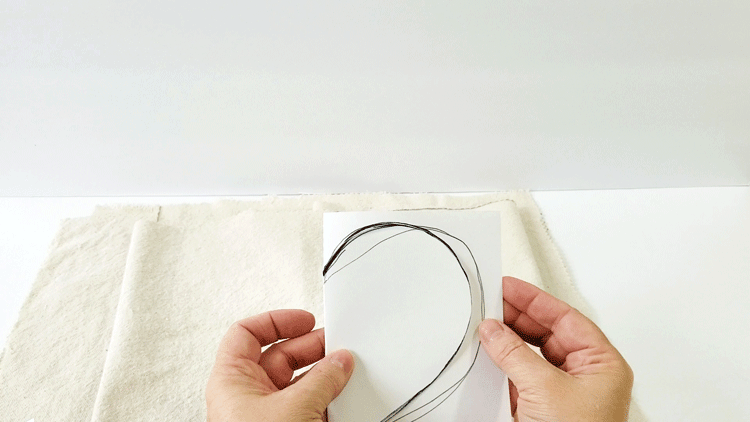 Draw half the heart from the side with the fold. You can see in the photo below it took me a couple of tries to get my heart shaped the way I wanted it. 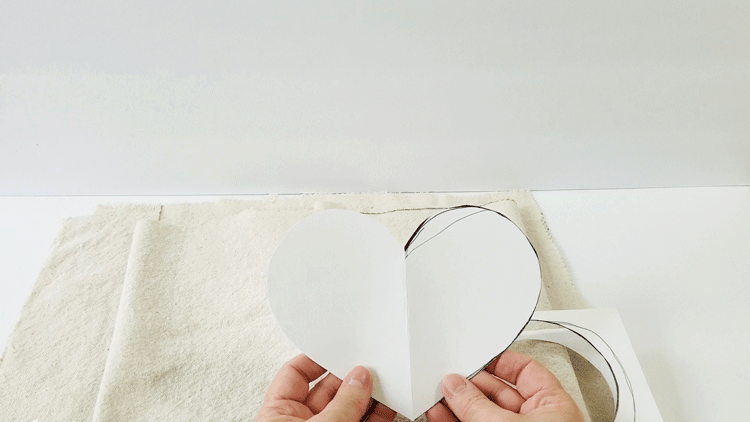 Cut out the shape and unfold to reveal your perfectly shaped heart. Easy peasy! 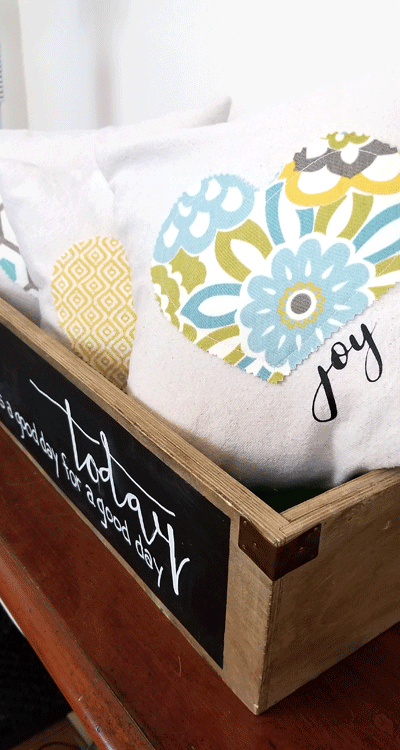 Trace with a sharpie marker onto the back of your fabric pieces. Cut them out using the pinking shears. 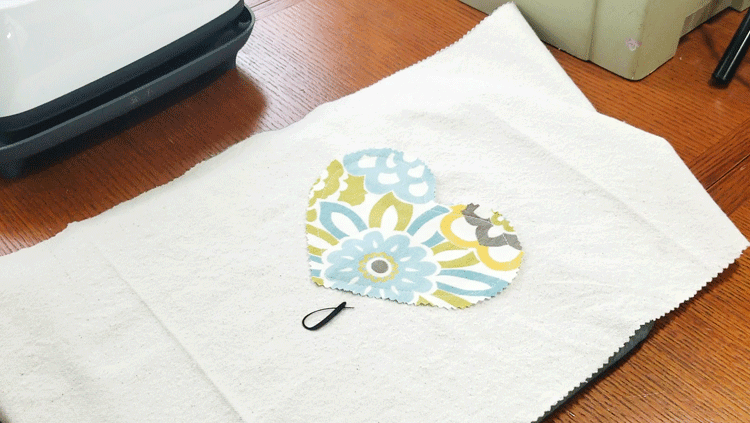 Place the cut heart where you want it on the front of the drop cloth. Pin and stitch around the edge of the heart. Go slow around the curves. Fire up the Silhouette design space and choose a font for your text. I used Solar for mine. The letters had to be pretty small to place them where I wanted them and this font was not the best one to choose. I love it but the “swoops” that connect the letters get really thin when the design is small. So all of them tore when I removed them from the mat. This was not the end of the world but I had to place them and press them onto the fabric one at a time. If I was doing this again I would choose a font that had wider areas that don’t tear. Here is my screen shot after I mirrored the text which is important when using text with heat transfer vinyl. Once these have been cut remove them from the mat and lay them onto the fabric. 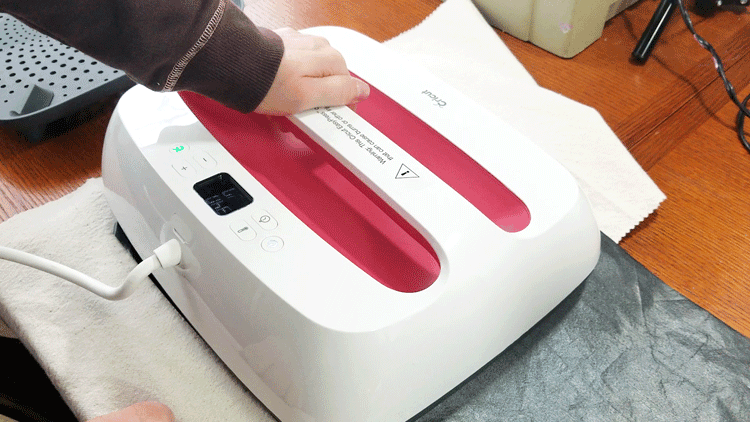 The heat transfer vinyl has a built in transfer tape. 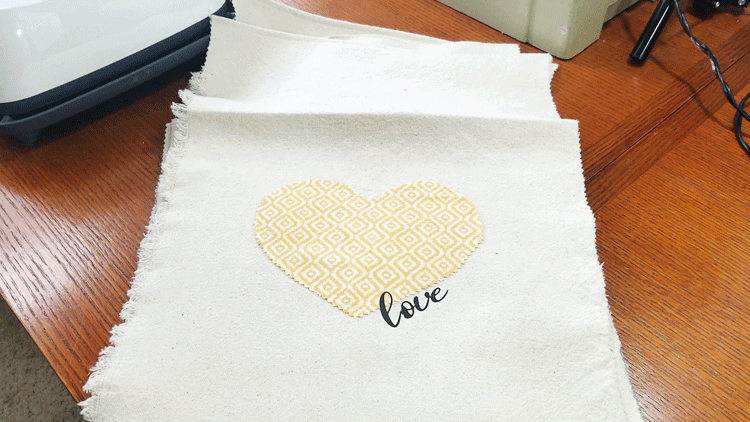 Once the letters are on the fabric use the iron or the Cricut Press to adhere it to the fabric. I had to do mine one at a time so it took a little bit longer. It’s okay though. They came out nice. When the front is all done and you are happy with it, it is time to sew up the side seams. Fold the top and the bottom ends with right sides together until they are overlapping like before. You can use the iron creases as guides for the top and the bottom. 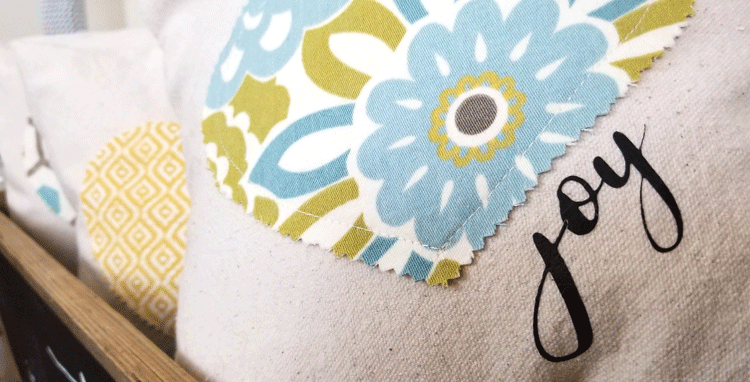 Once they are just the right size based on the creases and the pillow form, stitch along each side using a half inch seam allowance. 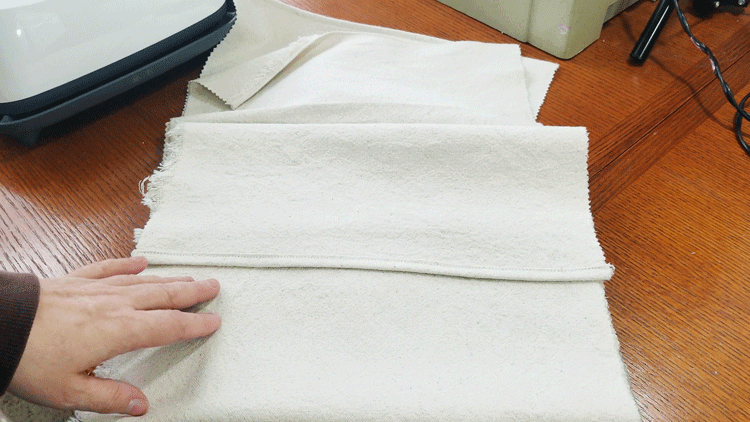 After the edges are stitched you need to remove the extra bulk from the corners. Basically you cut at an angle removing some of the seam allowance. Be sure not to cut the stitching because it will leave a hole. Once you have all the corners clipped it is time to turn it right side out. Be sure to poke the holes out to a nice point. Then you can add the pillow form and you are all done! They really turned out cute. At first I had them on my couch. They looked fine but I really liked them in my fun wooden box. The words don’t show but if I keep them out after Valentine’s Day that is just fine. So there you have it, Valentine’s Day pillows that you can keep on using throughout the year and that actually match the decor. If you would like to see other throw pillow ideas check out these Wonder Woman pillows and the coordinates pillows I made for a friend. They came out nice too. 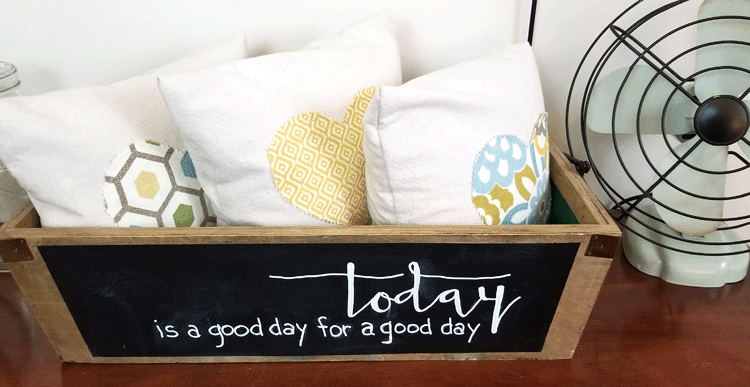 Those amazing little pillows fit in so well with your other decor, I’d leave them out all the time! Thanks so much Nancy. I think I will leave them out! !